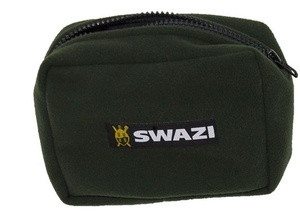 Useful, belt mountable pouch from SWAZI of New Zealand. Great for small items, gives easy access and is well made. Quality YKK zip, made from the windpro/polar fleece material, so its very quiet to use too. Purchase through PayPal by using the "Add To Cart" button above or use the form below to order the SWAZI Mojo Pouch . Feel free to contact us if you have any questions about the SWAZI Mojo Pouch .